Varisian fortune-tellers from across Golarion use the mystic harrow deck to read fate and predict the future, but few have ever mastered the mysterious harrow to such a degree as Sonnorae, a long-dead bard from the Age of Darkness. Fearing her collection of stories would be lost when she died, she created a demiplane withn her own harrow deck to contain them. Over time, these stories took on lives of their own, and melded with the images on the cards themselves. But not all stories have happy endings, and the storykin who inhabit the Harrowed Realm have their own motivations and plots for power or even escape into the real world. When the PCs find themselves drawn into the Harrowed Realm in search of a disappeared scholar, they must use all their wits and steel to navigate the landscape and politics of this strange wonderland and make it home again. 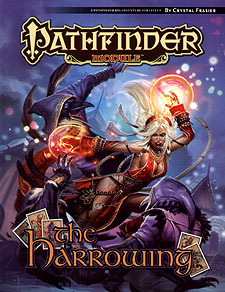 The Harrowing is an adventure for 9th-level characters, written for the Pathfinder Roleplaying Game and compatible with the 3.5 edition of the world's oldest RPG. It features an entire plane of fanciful locations and characters inspired by the popular harrow deck of the Pathfinder campaign setting. In addition, you'll find a brand-new monster and an optional rules subsystem allowing players to bend reality to their wills by using all 54 cards in the Pathfinder Campaign Setting Harrow Deck to manipulate the strange demiplane in which they adventure.